This Act established self-government in the Province with what was the most advanced democratic constitution in the world at that time. The Constitution Bill passed by the South Australian Parliament was the first Constitution in the Australian colonies to provide manhood suffrage; neither New South Wales in 1853 nor the following year Victoria and Tasmania, had included this in their Constitutions. The document shown, the first page of the Bill as passed in South Australia, was sent to Britain for Royal Assent (see Research trail below). 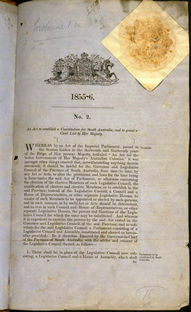 The South Australia Act also provided for a bi-cameral Parliament with full legislative authority, subject to reservation of some Acts for the Royal Assent. The Parliament comprised an 18-member fully elected Legislative Council, based on a property suffrage, and a 37-member Assembly elected on the broadest male franchise, providing every male resident over 21 years with a vote after six months registration (providing he was not convicted of a felony and under sentence). The adoption of the 'one man, one vote' principle secured the abolition of plural voting, common at the time, which allowed electors to vote in any electorate in which they owned property. The Act also provided for a third of the Council members to retire every four years; and for the members of the Assembly to have a maximum term of three years. A Bill had been submitted for approval by the Governor and Council in 1853. Many of the colonists were strongly opposed to some of its provisions, particularly those for a restricted franchise for the Assembly and for an appointed Legislative Council. Their petitions of protest were successful and the 1853 Act was disallowed, resulting in the adoption of this more radical and democratic Constitution. The Constitution Act 1856 received the Royal Assent in June 1856. On 2 April that year, South Australia enacted a law introducing another democratic reform, the secret ballot, adopted two weeks earlier in Victoria. South Australian Electoral Commissioner William Robinson Boothby pioneered this reform, based on ballots pre-printed with the candidates names, like the ones now widely used. The voter marks the form in secret and places it in a sealed box, from which the ballots are collected and counted so that no one can be identified from their voting paper. Elections in the Australian colonies before this time had followed the English practice, and were conducted ‘on the voices’. Voters assembled at local election centres and when they called out the name of their chosen candidates, the choice was then entered on a register. This public process made the voter vulnerable to both bribery and intimidation, and caused wide concern. William Boothby, the eldest son of South Australian Supreme Court Justice Benjamin Boothby, was Electoral Commissioner for South Australia, in charge of every parliamentary election from 1856 to 1903. Boothby's system was adopted for use in Federal government elections in Australia, and the Federal seat of Boothby in Adelaide was named in his honour, as he was State Returning Officer for the first House of Representatives election in 1901. In the second half of the 19th century, the use of the secret ballot spread to the USA and to Europe; in 1892 Grover Cleveland became the first US President elected by Boothby’s system, universally referred to as 'the Australian ballot' for nearly a century. Castles, AC and Harris, MC, Lawmakers and Wayward Whigs, Wakefield Press, Adelaide, 1987. Keeley, Rod, 'The Secret Ballot', in Brian Crozer If We're So Great, Whay Aren't We Better? A Critical Look at Six Great South Australian Firsts, South Australia Old Parliament House Museum, Adelaide, 1986. The Constitution Bill passed by the Legislative Council of South Australia, No. 2 of 1855–56, was reserved for the Royal Assent when it was submitted to the Governor on 4 January 1856, although it invokes the authority already granted by the Australian Constitution Act in 1850. Queen Victoria assented to the Act on 24 June 1856 and the new Constitution was proclaimed in South Australia on 24 October 1856. The Assent original of the Act has not been found in South Australia, but a search in the Public Record Office (UK) found the single page shown here, bound with a later copy of the remainder of the Act. The full transcript of the Act on this website was made from a printed copy of the Act.